The big beautiful border wall promised during the 2016 campaign is being built as a see-through barrier of steel slats, President Donald Trump tweeted Tuesday night. Trump’s concession and rhetorical turnaround come after the Hill Democrats used their leverage on the business-first leadership of the GOP — and among Trump’s Hill outreach deputies — to repeatedly block construction of his favored concrete walls. The prototype concrete walls are standing in the sand near San Diego. … has concluded that denying President Trump his wall is perhaps the surest major defeat Democrats can hand the President in his first year. At the same time, GOP leaders slow-rolled Trump’s budget requests and engineered the 2018 defeat of his “Four Pillars” immigration reform in complicated Senate and House votes. 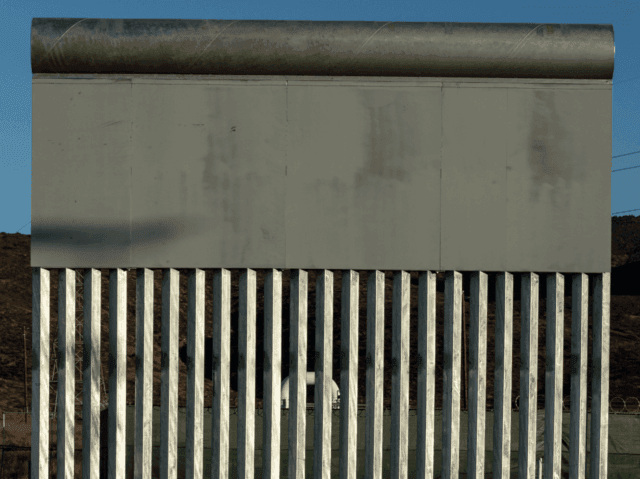 However, Trump is getting a few billions of dollars to extend the 30-foot steel-bollard walls, which border agents prefer because they can see through them to the Mexican side of the border. The bollard walls come with steel plates to deter climbers and cost roughly $20 million a mile, complete with roads. Trump may get $1.6 billion for extra border walls in 2019 depending on the outcome of the closed-door negotiations on Capitol Hill. But the 2019 budget deal reportedly also will block several cheap labor visa programs pushed by business groups, sources tell Breitbart News. That is good news for the President because it will help push up wages and salaries before the 2020 election.